Email may be one of the best ways to communicate, but it fails to provide adequate control to time-sensitive information - not to mention the often needed "undo send". Now, there's a new service in town, and it can solve all that: Dmail. The Dmail is a new service from Delicious' creators, and allows us to send encrypted emails that can expire after a preset time. For now it's available as a Gmail extension only (though it should be expanded to other email services in the future), but the nice part is that you can send emails to anyone, whether they're using Dmail or not. 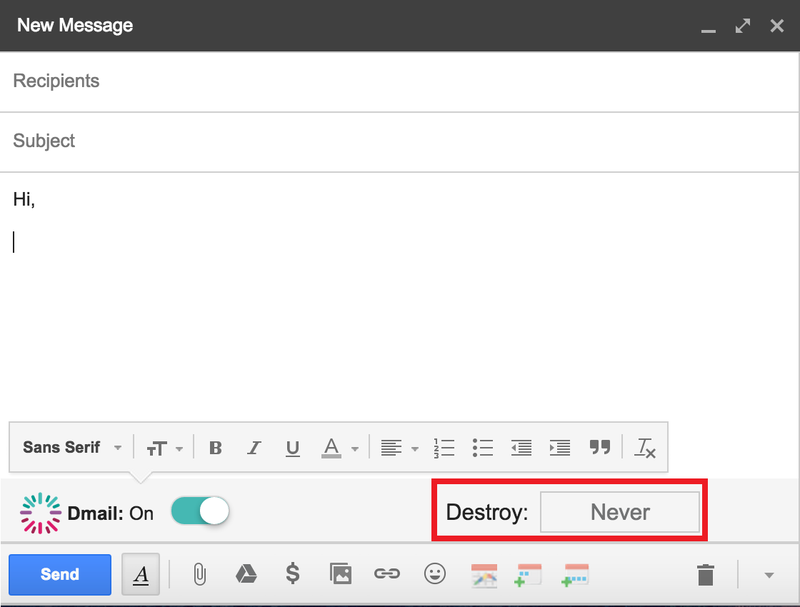 If the person receiving the email is also using Dmail, they'll be able to read the message immediately in the Gmail window. If not, they'll see a link redirecting them to open the message in a different window. Suffice to say, if the message has expired, neither case will be able to access it. Besides the preset self-destruction timers; you can also send a regular message with no expiration date - but with the ability to recall it at any time later on. Though it won't stop anyone that has already seen it from replicating it; it effectively works as an "undo send", that will prevent anyone else from reading it, in case they haven't yet.